John S. Foster Jr. was Consultant and Vice-President at TRW, Inc. (1973-1994). Other institutional affiliations include the United States Department of Defense and Lawrence Livermore National Laboratory. His research interests include nuclear physics and nuclear weapons. September 18, 1922Birth, New Haven (Conn.). 1948Obtained BS, McGill University, Montréal (Québec). 1952Obtained PhD in Physics, University of California, Berkeley, Berkeley (Calif.). 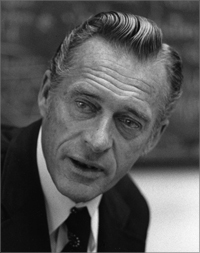 1952 – 1965Division Leader, Experimental Physics (1952-1958); Associate Director (1958-1961); and Director (1961-1965), Lawrence Livermore National Laboratory, Livermore (Calif.). 1965Member, Ballistic Missile Defense Advisory Committee, Advanced Research Projects Agency (ARPA), United States Department of Defense. 1965 – 1973Director of Defense Research and Engineering, United States Department of Defense, Washington (D.C.). 1973 – 1990Member, President's Foreign Intelligence Advisory Board. 1973 – 1994Vice President, Energy Research and Development, Energy Systems Group (1973-1979); Vice President, Science and Technology, Energy Systems Group (1979-1988); and Consultant, Energy Systems Group (1988-1994), TRW, Inc, Euclid (Ohio). 1990 – 1993Chair, Defense Science Board, United States Department of Defense. Division Leader, Experimental Physics; Associate Director; and Director (Livermore campus). Vice President, Energy Research and Development; Vice President, Science and Technology; and Consultant. Member, Ballistic Missile Defense Advisory Committee. Oral history interview with John S. Foster, Jr., 1968 December 3, 15, and 1969 January 7. Oral history interview with John S. Foster, Jr., 1991 August 7. Physicists advising on national security [sound recording], 2012 April 1. Let robots do the dying / by Simon Ramo ; with an introduction by John S. Foster.